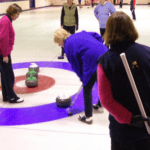 Amherst Curling Club will hold registration for the Junior Program (12-18 years of age) and Lite Rocks Program (8-12 years of age) October 18th between 10:00 and 12 noon. This is a great opportunity for girls and boys to make new friends, learn new skills and exercise while having fun. Parents/Guardians are invited to the Club, 45 Prince Arthur Street, to view the facility, get information and register. For further information contact Brian Faught @ 902-661-6400 for the Junior Program or Joan Cameron @ 902-667-3686 for the Lite Rock. Juniors will begin on Nov 4th after school, Lite Rocks will begin on Nov. 1st., Saturday morning. The cost is $100 for the full season or $50 on registration and $50 half way through. Equipment is provided by the club. Hi just wondering if u can still register for lite rocks and is so what time on Saturday morning does this happen?